New Delhi, Aug 23 (IANS) The creamy layer ceiling for Other Backward Classes candidates for securing government jobs was on Wednesday raised to Rs 8 lakh as the union cabinet cleared a proposal for a commission to work out sub-categorisation within OBCs for a “more equitable distribution of reservation benefits”. 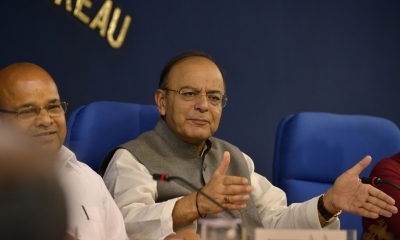 Union Finance Minister Arun Jaitley said after a cabinet meeting here that OBC families earning up to Rs 8 lakh per annum will not be considered in the creamy layer. Earlier, this ceiling was Rs 6 lakh per annum. Asked if the raised limit will also be applicable to public sector undertakings, Jaitley said the issue was under “active consideration of the government”. Jaitley said the cabinet approved a proposal for setting up of a commission under article 340 of the Constitution to examine the issue of sub-categorisation of the OBCs. The commission will submit its report within 12 weeks from the date of appointment of the Chairperson. Jaitley said the National Commission for Backward Classes had given its recommendation in 2011 that there should be sub-categorisaion and the Parliamentary Standing Committee had also given such a recommendation.